In December, the Muslim American charity, Helping Hand for Relief and Development (HHRD), organized a conference to honor 'World Disability Day' at a government-managed college in the Pakistani city of Timergara. This seems like a noble cause. But Islamist groups often use noble causes to advance their agenda. And HHRD is one such Islamist group. Sponsors of the HHRD event in Pakistan included the Falah-e-Insaniat Foundation (FIF), the charitable wing of Lashkar-e-Taiba, the terrorist organization responsible for the 2008 Mumbai attacks. In 2016, FIF itself was designated a terrorist organization by the U.S. Treasury Department. Another organization present at the HHRD conference was the Milli Muslim League, a political party recently launched by Lashkar-e-Taiba founder, Hafiz Muhammad Saeed, on whom the U.S. government has placed a $10 million bounty. But HHRD didn't stop at Pakistan's most infamous terrorist network. Its conference also included Al Khidmat, the charitable arm of the South Asian Islamist movement Jamaat-e-Islami. In 1971, during the Bangladeshi Liberation War, Jamaat-e-Islami fighters murdered thousands of Bangladeshis in cold blood. In 2006, JI's own website announced that Al Khidmat had transferred $100,000 to the Palestinian terror group Hamas for their "just Jihad." HHRD does not merely invite Al Khidmat to its conferences. 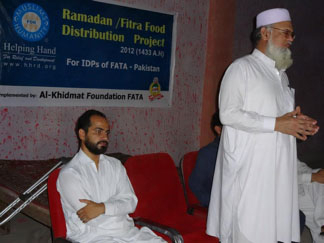 Al Khidmat openly boasts of the support it receives from HHRD. In fact, HHRD appears to have been working with both Al Khidmat and Hafiz Saeed's designated terrorist group, the Falah-e-Insaniat Foundation, for many years. A 2009 HHRD report mentions both organizations, and a Pakistani newspaper report reveals both HHRD and the Falah-e-Insaniat Foundation were working on the same projects. Founded in 2005, HHRD reports receiving funding from the British government, the World Health Organization and prominent American charitable foundations such as Microsoft, Cisco, PepsiCo, and Dell. HHRD operates as a self-described "sister organization" of the Islamic Circle of North America (ICNA), a prominent American Islamist group that has publicly identified itself as a Jamaat-e-Islami organization. HHRD and ICNA even share the same logo. ICNA's conferences, the largest in the American Muslim calendar, include prominent Jamaat-e-Islami officials such as Yusuf Islahi, who reportedly claims that Jews were responsible for the 9/11 attacks. Counter-terrorism analyst Abha Shankar recently noted that HHRD is working with ICNA and Al Khidmat to establish a hospital in the Pakistani city of Karachi. Shankar discovered that the Al Khidmat official leading the project is "closely tied to the U.S.-designated Kashmiri terrorist organization, Hizbul Mujahideen (HM) and its leader Syed Salahuddin." HHRD's dalliances with these violent Islamist networks are not limited to Pakistan. For many years, HHRD has regularly organized fundraising evenings and events at the Islamic Center of New England (ICNE), which is notorious for its regular promotion of extremist clerics. The former imam of ICNE was Hafiz Masood, the brother of the very same Lashkar-e-Taiba leader, Hafiz Muhammad Saeed. Today, Masood serves as a spokesperson for one of his brother's terrorist organizations in Pakistan. Ten years ago, federal investigators uncovered an enormous network of terrorism-financing organizations centered around a Hamas group named the Holy Land Foundation. That led to the last major federal prosecution of terror finance networks in America. Today, Islamist charities, flush with money from international bodies and American charitable foundations, operate with impunity, openly working with designated terrorist organizations and prominent extremists. The Trump administration must take the threat posed by these American Islamist charities seriously. Just how many terrorist connections must be uncovered before groups such as HHRD are shut down?